Statement Many of the premiere AHL commentators/bloggers/etc predicted that this would need to be a statement game for Hershey. They finally get a shot vs WBS at Giant Center with their home crowd buzzing and they were wearing their special edition Calder Cup championship jerseys with the logos of the teams they defeated in last year's playoffs. The buzz was high. To sum it up, this is the statement that Bears PbP man John Walton made on twitter after the game.
" In a word, ugh. Penguins impressive in all facets of the game tonight, 6-2 the final." 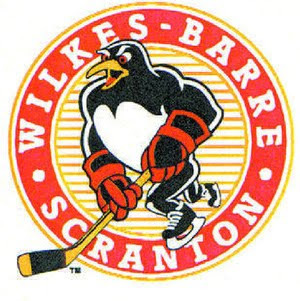 Ugh was a pretty popular phrase in Giant Center, but for the WBS fans the word was "Woooo!!!" The Pens moved to 8-0, and more importantly, picked up their 6th point (in 3 games) of the year against the Bears. The Bears got off to a hot start with a Keith Auccoin goal 49 seconds into the game, but the Pens would quickly have an answer and would not stop answering. Chris Conner scored the first Pens goal of the game just 26 seconds after Auccoin's, and then he picked up an assist a few minutes later on Andrew Hutchinson's powerplay "go-ahead" goal. Joe Vitale kept the flow going with a shorthanded goal midway through the 1st to give WBS a 3-1 lead after 10 minutes. Eric Tangradi put up his 1st AHL goal of the season with another powerplay goal just 27 seconds before the intermission buzzer to put the Pens up 4-1 and send some of the Hershey fans home early to trick-or-treat. Conner struck again in the 2nd period with his 2nd goal of the game, and this time it was Hutchinson who got the helper. Hershey showed a bit of life midway through the 3rd with a Zach Miskovic goal, but Zach Sill made sure that the comeback would go no further with a put-away goal to give WBS a 6-2 lead. This was such a huge win for the Pens. On paper, they picked up another 2 points against Hershey (which really makes it like 4 pts) which will certainly come in handy later in the year, and they kept their win streak going at 8-0. They also passed what has been the toughest test in the AHL for the last few years, and that was winning at Giant Center. Anyone who did not yet believe that we are for real this year may have been converted tonight. And if there already weren't enough reasons to be excited about this team, they won without premiere scoring winger Brett Sterling, who is still recovering from an injury. Not to rain on the parade, but eventually they are going to have to lose. (I'm just glad it wasn't tonight.) When they lose is unknown, but it will not be in October. Hutchinson and Tangradi have made an immediate impact this weekend, though it is unknown how long Hutch will be in WBS after Letang's injury and Michalek's status unknown.